What is your university affiliation? Note: UC Santa Cruz currently houses 53% of its students, which is highest of all UC campuses. Note: UC Santa Cruz currently has ten residential colleges, which primarily house lower-division undergraduate students. Colleges form a key part of the university’s identity and provide a distinctive undergraduate experience. Note: UC Santa Cruz currently provides 239 units of faculty and staff housing. Employee housing is comprised of rental apartments and for sale townhomes, condominiums, and single family homes. Note: Outdoor recreation space includes outdoor sports fields, courts, and an outdoor pool. The UC Santa Cruz campus currently has approximately twelve acres of outdoor recreation space. Note: Several trends and potential initiatives may transform how people move around in the future. Uber and Lyft ride share services have been very popular at UC Santa Cruz and may continue to provide an important mobility function. Autonomous vehicles may soon become more prevalent in this region and impact the transportation network. Both ride share services and autonomous vehicles have the potential to decrease the need for parking on campus. Improvements to the Metro transit system, UCS Santa Cruz shuttle system, pedestrian paths, and bicycle facilities could also promote a more multi-modal circulation pattern that relies less on driving and parking. Three major landscape types -- meadows, forests and forest edge, and ravines -- combine to create the powerful physical presence of the UC Santa Cruz campus. Each type has its own distinct characteristics and each requires a different development approach in order to protect its essential character and to maintain and enhance the campus’s ecological diversity. "If the University maintains this meadow space as an open area, by the year 1990 it may well be one of the most rare, gratifying and valuable assets of the campus." When entering the campus from the south, the undeveloped meadows form a dramatic foreground to the larger campus landscape beyond. Sensitivity to the visual character of the lower campus meadows, preservation of the integrity of the meadow boundary, and maintaining the continuity and visual “sweep” of the meadow have all contributed to the dramatic entry to our campus. During the late nineteenth and early twentieth centuries nearly all the redwood, oak, and fir on the site were cut and used to fuel the kilns that the Cowell Lime and Cement Company used to transform limestone quarried nearby into cement. As a result, the existing forest is entirely second-growth and still in transition, shaped by extreme human intervention over 100 years ago. Wise management presents opportunities to restore a badly scarred landscape, improving and enhancing its environmental integrity. Covering well over one-half of the campus, the forest’s towering redwoods dominate the scale of the buildings, paths, and roads they surround, providing a unifying force compatible with a wide variety of building types and styles. Within the deeply shadowed forest individuals find areas of privacy and isolation, rare on university campuses, that punctuate the collegial and social open spaces of the campus's building clusters. The meeting point of the forest and the meadow - the forest edge also known as the "ecotone" - contains species native to both forest and meadow, making it an area of particular beauty and ecological diversity. The Moore Creek and Jordan Gulch ravines and their several fingers run north-south through the forest of the campus core, cutting deeply into the terraced topography. As the ravines join together and emerge from the forest into the meadows, their routes are marked by the dense and visually powerful stands of bay, buckeye and oak they contain. As much as 70 feet deep and 250 feet wide, they provide topographic definition between the colleges and sub-areas of the academic core. Their steep sides provide a challenge to development of east-west cross-campus travel routes. "Further, it is important to think clearly and with imagination before accepting the standards and clichés of modern monumental, or normal campus, building types. An architecture here must grow out of the problems, restrictions and potentialities of the site. Usual relationships of building groups in a formal pattern may violate the topography beyond repair. Grading and reforming of the land there will be, but kept to a minimum. Tree-clearing will be inevitable, not because the architecture forces it, but because the ultimate landscape demands it ... To a greater extent than any of us have faced heretofore, the buildings are less important in the visual composition than the trees." The central campus begins where the meadows and the forest meet, and it extends north into the forested lands. At the center is the academic and service “core” of institutionally scaled buildings -- libraries, lecture halls, laboratories and other research facilities, art studios and performance venues, bookstore and student activity buildings -- surrounded on three sides by smaller scale clusters of residential colleges and housing. The campus’s Physical Design Framework encourages concentrated development in both the core and the colleges in order to leave as much land as possible in its natural state, avoid sprawl, and support pedestrian movement. The tradition of developing residential colleges in distinct clusters has proved to be an effective approach to building in the campus's extraordinary natural environment. This development pattern is based on compact building footprints that create a hierarchy of public exterior spaces to support and encourage gathering and interaction. The goal in clustering the colleges, in the words of Clark Kerr (then President of the University of California), was to create a campus that would "seem smaller even as it grows larger". For more information on the campus design philosophy refer to the UC Santa Cruz Physical Design Framework. 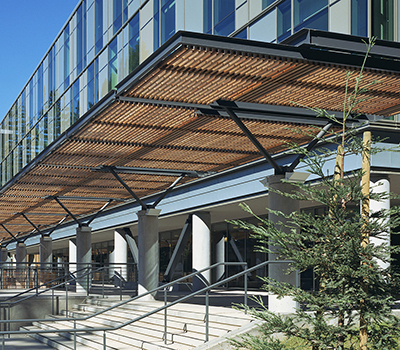 The pedestrian path system is organized in an overall "warped grid" pattern connecting the colleges to each other and to the core, while responding sensitively to trees and contours. Paths that are safe and easy to traverse, with new bridges where necessary, will increase pedestrian circulation and create opportunities for informal encounter and engagement. While the full vision of the path network has not yet been implemented, it is intended to connect all major classrooms, the libraries and other academic and support facilities within 10 to 15 minutes from nearly everywhere on campus. Additional interpretive information on paths and trails will lead to deeper understanding and enjoyment of all campus landscape types. To facilitate a healthy pedestrian network, most parking is located peripheral to the campus core. The roadway system, which is structured as a "ladder" stepping up the contours of the land and connecting the east and west colleges, is intended to emphasize transit, pedestrian, and bicycle use. Since campus circulation is not readily understood by the newcomer, the circulation system is intended to be organized simply and marked clearly. The campus is home to a wide variety of habitats and species, and actively works to preserve wildlife corridors and habitats. California red-legged frog (Rana aurora draytonii), which is listed as a threatened species under the federal Endangered Species Act, breeds on campus in the UC Santa Cruz Arboretum Pond and disperses along riparian zones in the branches of Moore Creek and other well vegetated areas. The Ohlone tiger beetle (Cicindela ohlone) is known to occur at 15 locations in central and western Santa Cruz County, including Marshall Field in the north campus and in the southwestern corner of the campus across Empire Grade. The beetle is found only in coastal types of soil, where remnant stands of native bunchgrasses, including California oatgrass and purple needlegrass, are located. Under the Habitat Conservation Plan developed by the campus in conjunction with the development of employee housing on the lower campus, the university has agreed to protect habitat or potential habitat in two locations for the California red-legged frog and Ohlone tiger beetle: 13 acres in the southwestern corner of the campus is preserved in perpetuity and 12.5 acres near the campus entrance is preserved for sixty years. An unusual geologic feature on the campus is the "mima mounds" topography in the southwestern corner of the campus and in Marshall Field in the upper campus area. These low flattened, natural mounds are 30 to 60 feet in diameter, and are sometimes separated from each other by moist depressions called vernal pools or "hogwallows". The mounds generally occur in flat to gently sloping grassland areas with clay pan or hardpan soils that are waterlogged during the rainy season. During this period the vernal pools fill with water, while the mima mounds remain relatively dry. The process by which the mima mounds were formed is not understood. The UC Santa Cruz campus slopes upward from an elevation of 300 feet at its southern boundary to an elevation of 1,200 feet at its northwestern corner. The campus is located on the southwest end of Ben Lomond Mountain, one of the ranges that make up the Santa Cruz Mountains. Ben Lomond Mountain consists of a series of broad, gently sloping marine terraces stepping upward from the shoreline to a height of 2,600 feet at the summit in the northwest. At least five marine terraces stranded above the present sea level by episodic uplifting have been identified. The terraces form the relatively flat areas which form the sites most suitable for buildings. Several long, branching ravines transect the terraces, dividing the central and south campus roughly into thirds. The intersecting terraces and ravines form a landscape of extraordinary complexity. The dramatic combination of varying slopes, soils, hydrology, and orientation supports a range of physical environments and plant communities that make each campus place unique. The campus' underlying geology is unique and plays an important role in where we can build. Two major types of metamorphic rock make up the solid base on our campus: marble and schist. These metamorphic rocks are surrounded by intrusive igneous rocks, predominantly quartz diorite. Marble and schist underlie most of the central and lower campus, with some intrusions of quartz diorite, while quartz diorite is predominant in the upper campus area. In the upper campus area, some areas are overlain by thin, eroded remnants of the Santa Margarita sandstone and marine terrace deposits. There are small areas where more recent surface materials have been deposited, including alluvium and colluvium. Areas of the campus underlain by marble are particularly challenging to build on. Marble is dense and solid in some areas and highly fractured in others. Karst features (including ravines, sinkholes, closed depressions, underground streams, and caverns) develop in areas of fracture, joints, and faults where groundwater flow dissolves the marble. Construction in karst terrain is potentially hazardous because many karst features are not visible at the surface. Before building in areas underlain by marble, extensive geotechnical studies are needed to ensure that subsurface karst features are identified. Building foundations are then designed to address the hazards, and often carry higher construction costs. The northern third of campus, also known as the “Upper Campus” is undeveloped land. Although it has not been developed with buildings, it is a much valued open space. Its varied vegetation, which include sensitive northern maritime chaparral and coastal prairie, are used for research and teaching, and the numerous fire roads form part of a regional network of trails connected to Wilder Ranch and Henry Cowell state parks. The northern zone is relatively flat, and the underlying geologic units, primarily granitic and sandstone, are not as difficult to build on as the marble in the campus core and meadow. However, the distance from classrooms and housing, the lack of road access and utility infrastructure, as well as the need to protect sensitive habitat and vegetation has thus far prevented development. Early in the campus’s history, campus planners made the decision to protect the great meadow in the southern part of the campus and concentrate buildings in the central part of the campus, which became the campus “core.” The topographic pattern of ridges separated by deep ravines, as well as the presence of sinkholes in the underlying marble bedrock, can make building in the core quite challenging. Preserving the visual and ecological integrity of the forest has also been an important goal of past planning for buildings in the core. At the same time, siting new buildings near existing buildings in the core offers opportunities to take advantage of existing roads, paths, public transit, and utilities. Most recently, the Biomedical Sciences Building was constructed on a former parking lot next to existing science buildings, and the new Environmental Health and Safety Facility is being built along Heller Drive near Kerr Hall. When entering the campus from the south, the undeveloped meadows form a dramatic foreground to the larger campus landscape beyond. When viewed from above, their broad sweep extends to distant views of the city of Santa Cruz, the Monterey Bay, and the Pacific Ocean. The campus has generally avoided building in these meadows, except along the forest edge, where building heights have been kept relatively low so that the forest is still visible as a backdrop. The meadows also have value as habitat. 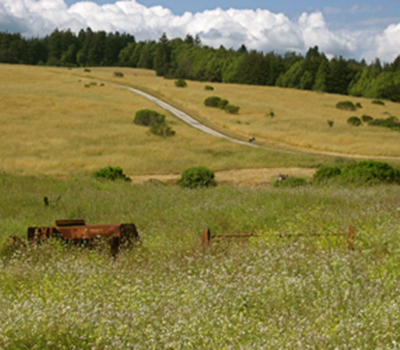 Consisting of patches of rare native grasses, the expanse of meadow across the campus from east to west forms part of a larger continuous open space that also includes the Pogonip and Wilder Ranch State Park. Golden eagle and other raptors are frequently seen foraging above. The meadows are primarily underlain by marble bedrock, and numerous sinkholes are present. However, there could be some advantages to building in the meadow, including the proximity to the core and to existing roads and infrastructure. The southern end of campus, entering from the intersection of Bay and High Street, is the main gateway to the campus. This area is home to some of the campus’s unique features: a Cowell Lime Works Historic District, which is listed on the National Register of Historic Places; the Center For Agroecology and Sustainable Food Systems (CASFS); and the UC Santa Cruz Arboretum. Several of the historic buildings have been adapted for a variety of uses. The Women’s Center occupies a house that was built in the 1850s for the owner of the lime works; the Cookhouse, where workers in the lime quarries and kilns ate their meals, is now the Office of Admissions; the Hay Barn, constructed in the 1860s, was carefully reconstructed in 2015 using the original timber frame construction techniques and is now the home of CASFS and a popular event space. 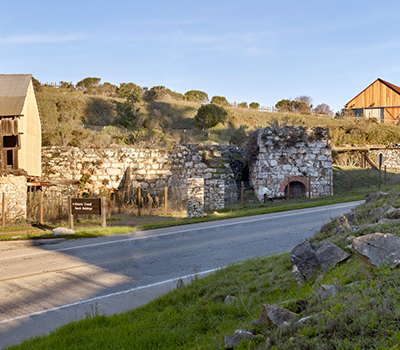 Other features of the Historic District, such as the lime kilns, the Cooperage, and remnants of a number of workers’ cabins, await restoration. The campus has also concentrated faculty and staff housing in this area for easy access to local schools and businesses. The gateway is considered an ideal location for campus programs that could also benefit the local community. However, any development must be planned carefully so that it does not affect the integrity of the Historic District. stacking pieces will decrease the number of features needed to be placed (max = 0). This zone is restricted from development due to . UC Santa Cruz is embarking on a new Long Range Development Plan (LRDP) to guide campus planning from 2020 through 2040. Think of it as the campus’s general planning framework. An LRDP designates campus areas for certain types of uses, such as housing, classrooms and recreation. It's not an approval to develop facilities or a mandate for growth. It's an important planning tool for providing the infrastructure needed to successfully educate students. Creating an LRDP takes time, expertise, and collaboration—vital components for a healthy process to which UC Santa Cruz is committed. Building within the spectacular natural environment of the UC Santa Cruz campus is not easy. The challenge in planning is to balance the requirements of an academic institution with the preservation of its redwood forests, sweeping meadows, deep ravines and expansive views. Finding a thoughtful place to nestle buildings within steep slopes, critical habitats, karst geology and sensitive vegetation requires creative thinking, challenging trade-offs and affirming our collective campus values. Help us take on this challenge by participating in this LRDP visioning activity. It only takes a few minutes to share your thoughts! Once you hit “Submit,” your input will be collected anonymously and shared with the LRDP Planning team. Your input is critical in helping us to develop a future campus plan. First, answer a few questions about who you are, and what you value. This will determine the program, or the type and combination of building components, you will be working with. Second, take some time to explore the natural environment, learn about the campus design philosophy, and understand distinctions between campus zones. This primer will give you strategies to help in the mapping activity, but if you don’t have the time feel free to go straight to the mapping tool. You can always go back to this primer if you need more information. Finally, use the visioning tool to create a future planning framework for the next twenty years. You will be dragging and dropping building components that will be needed to support growth through 2040, including academic, housing, campus life and recreational areas, onto the campus map. Working within the constraints and opportunities of existing campus conditions, feel free to leave comments as you make decisions on where to place elements. Your map will be submitted to the LRDP Planning team for consideration in the process. Thank you in advance for your valuable feedback! Explore the natural environment, learn more about the campus design philosophy and delve into the specific conditions of each campus zone here. Just click the buttons on the left to navigate through a tour. Want to just start the visioning activity? If you want to skip this at any time, click on the "Map Your Vision" button at the bottom of the tour. At any time you can return to the tour for more information. Want to save your program for later? If you don't have the time to complete the activity but want to do so later, click on the "Save" button at the top right corner of the page. You will be provided with a link that you can use to reload the activity where ever you left off. 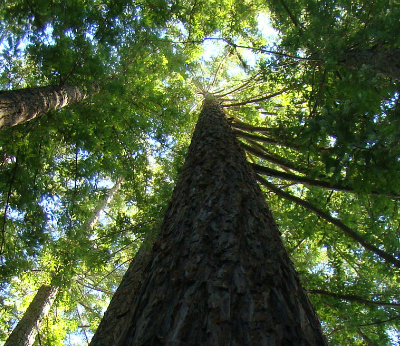 The UC Santa Cruz campus covers about 2,000 acres of forest, meadow, and ravines. Most campus development exists in the campus core and southern gateway. The campus site consists of a series of relatively level marine terraces separated by steep slopes. The site rises nearly 900 feet from south to north. The central and lower portions of the campus are divided roughly in thirds by two north-south drainages and their tributaries. Jordan Gulch and its tributaries delineate the eastern third of the campus, while Moore Creek and its tributaries delineate the western third. The campus landscape is as varied as its topography. Expansive meadows at the campus's main entrance gradually transition to redwood forests in the central campus and to chaparral and mixed evergreen forests in the undeveloped north and upper campus. Click the button below to learn more. Now that you've shared your values and explored the existing campus, use the mapping tool here to Map Your Vision. On the left are building components -- College Student Housing, Non-College Student Housing, Academic / Administrative, Faculty / Staff Housing, Parking, Outdoor Recreation and Campus Life -- that represent the buildings anticipated by 2040. Click on the "More Info" button for additional information on these programs. Click "Add" or simply drag and drop the building components in the areas of the campus map best suited for new development, while keeping in mind the various site conditions. You'll have an opportunity to add floors to your buildings, and leave specific comments about why you located development where you did. Densify the core, or expand into open areas? Cluster similar programs together or disperse across campus? Once you place all the building components on the plan, click "Submit Campus Plan". If you decide to submit before finishing, or do not want to include all building components, let us know why! Remember, if you don't have the time to complete the activity but want to do so later, click on the "Save" button at the top right corner of the page. You will be provided with a link that you can use to reload the activity where ever you left off. Your progress in the activity can be accessed at a later date using the URL below - click copy or e-mail to save the link. When ready later, click or paste the link into a browser to continue the activity where you left off. Thanks for participating! Do you still want to submit? We received your submission and appreciate your valuable feedback. The LRDP planning process will continue and there will be many more opportunities to contribute feedback.